Add some fashion flair to her closet with leopard prints in bold colors! With soft supple suede and a fully padded insole with lightweight sporty sole, these are sure to become one of her favorite things!" 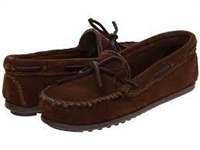 Our classic, iconic moc for boys is modeled after the stylish look of the Men's Classic Moc. The cushion rubber sole provides grip and comfort. Just slip on and go! Modeled after the ultra popular adult Chrissy slipper, the Charley lets the little ones stay cozy and show off their slipper style, just like the mom. By a size or two larger so that they last several more seasons. The original Tramper Boot, updated and made pint-sized. An added layer of fringe, a side zip for easy on and off. An ultra comfortable sole for little toes.